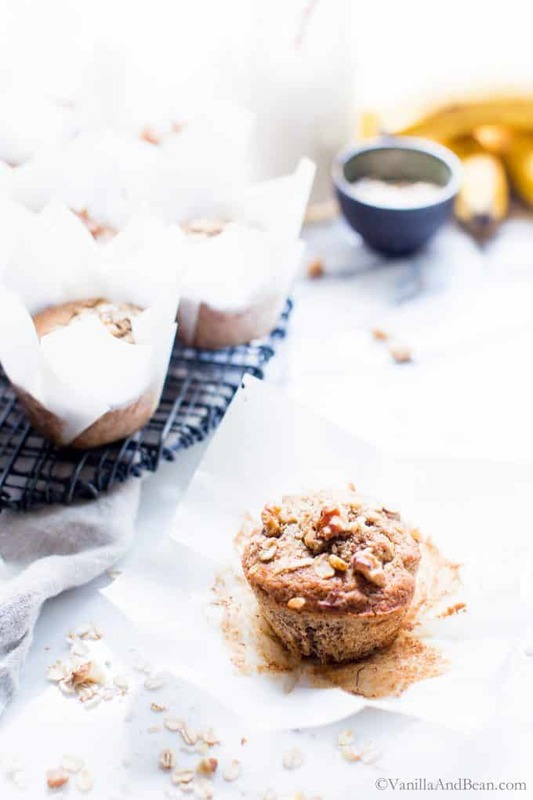 Naturally sweetened, and one bowl easy, Breakfast Banana Nut Muffins are a healthy grab n’ go quick breakfast or afternoon snack! vegan + gluten free | Disclosure: this post is sponsored by Bob’s Red Mill! 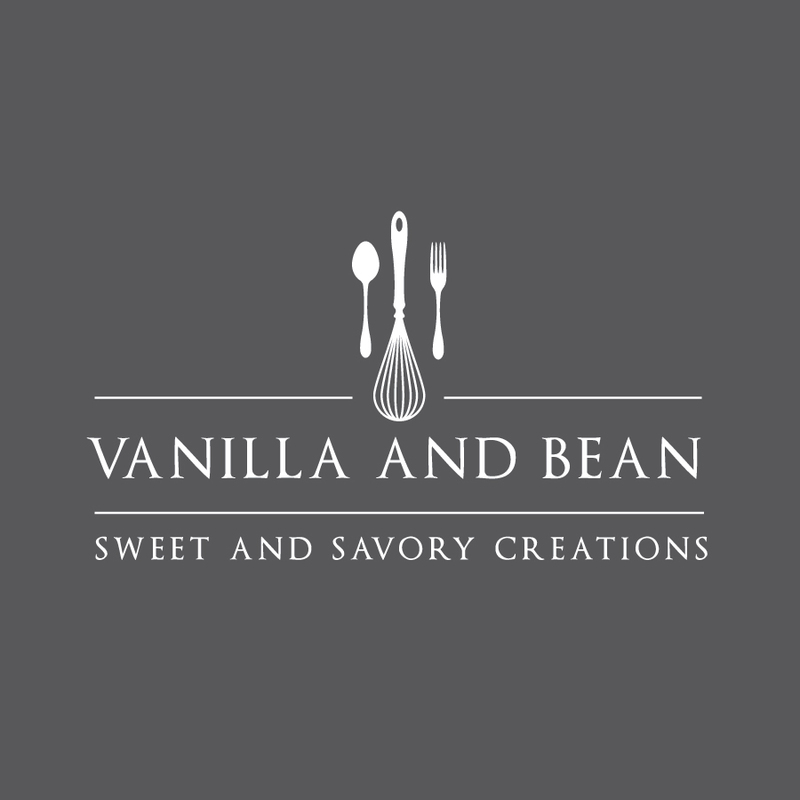 Thank you for supporting brands that keep Vanilla And Bean cookin! There’s good reason why banana bread is such a classic. It’s super moist, sweet, texture rich and ranks right up there with comfort food. It took some time to get these gluten free banana nut muffins just right. It started last summer when I had to go gluten free and vegan for a trial period. I’ve been testing these, teasing out the details to get them just right, off and on ever since. These vegan nut muffins are finally ready and I’m super excited to share them with you! Why Breakfast Banana Nut Muffins? Banana nut muffins are grab n’ go ready! Naturally sweetened with maple syrup. 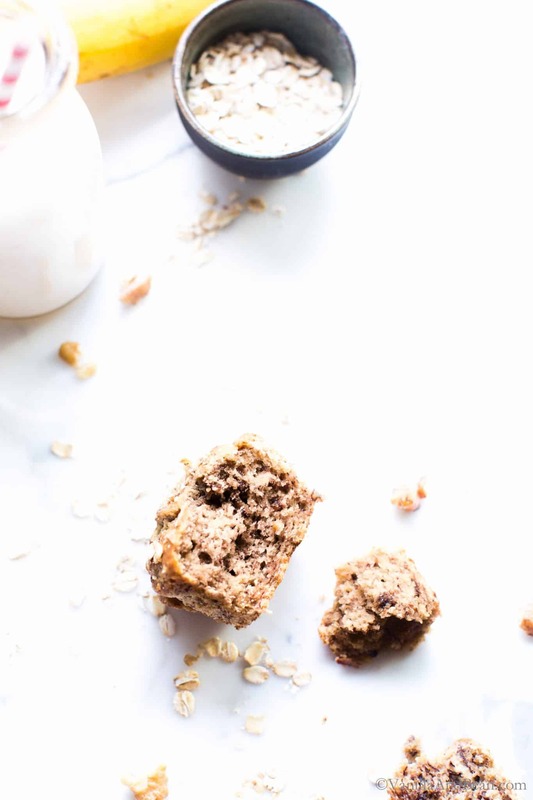 Made with whole grain oat flour, a bit of almond flour for a nutty flavor and structure and a touch of tapioca flour to help make these muffins light and fluffy. 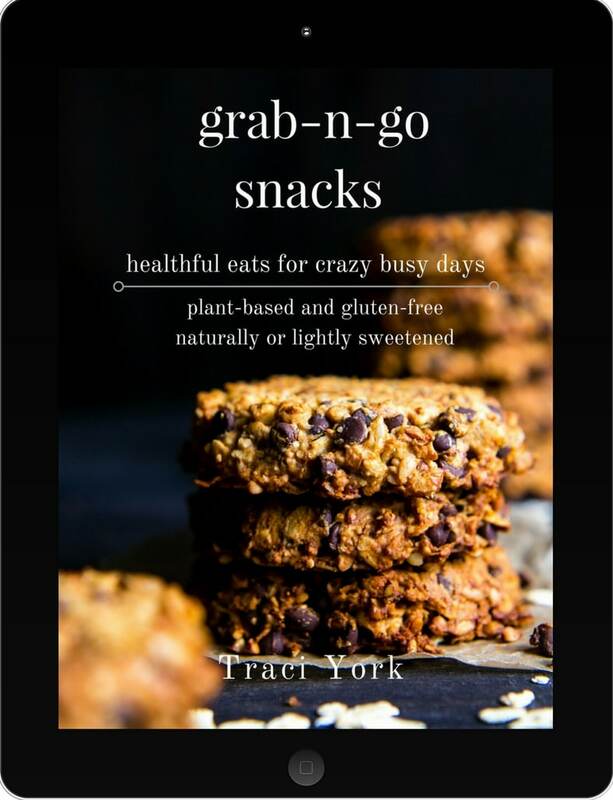 Easy to pack in a lunch box or stuff in your purse or backpack as you’re flying out the door! 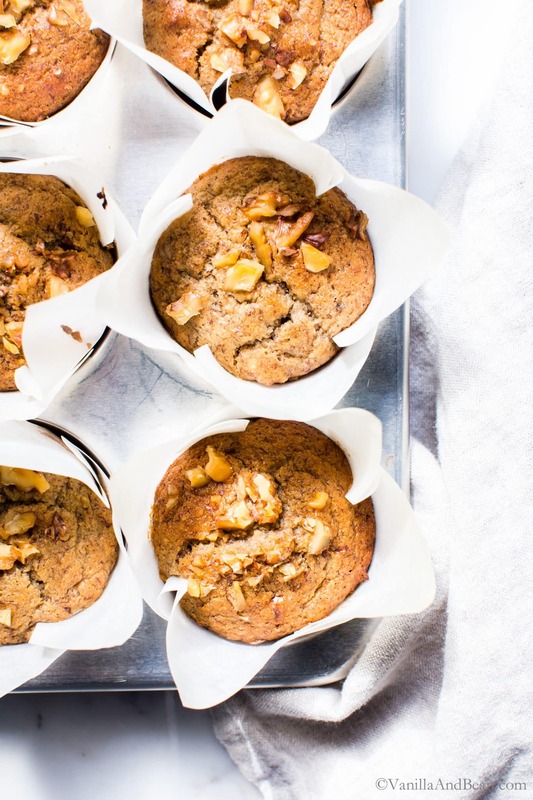 Because they’re made with whole grain, banana nut muffins keep us fuller longer. Best of all, this gluten free banana nut muffin recipe is easy to whip up when meal prepping even if short on time. 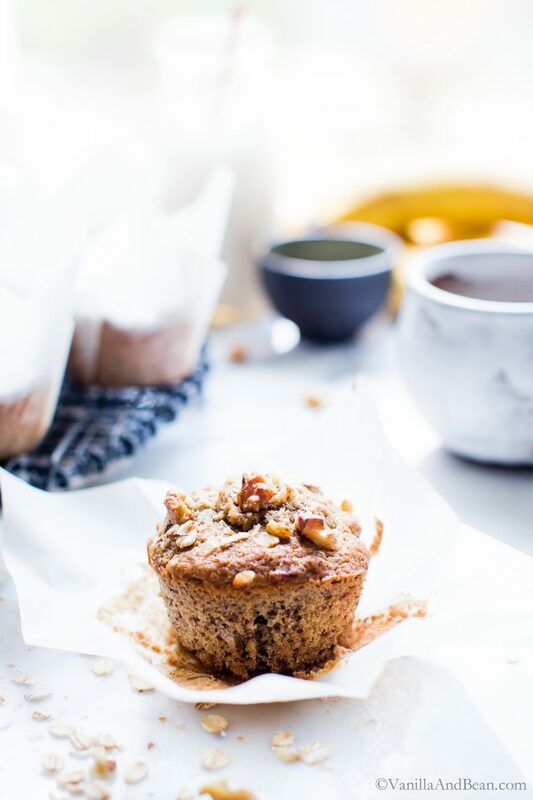 These gluten free and vegan banana nut muffins are made in partnership with Bob’s Red Mill. I’m super excited to share their pantry staples with you, highlighting a brand I trust for high quality ingredients to fuel my family’s lifestyle. Bob’s Red Mill pantry staples are accessible and offers a wide array of whole grain and gluten free options should you need. Since I’ve been in and out of a gluten free trial, Bob’s Red Mill Gluten Free Rolled Oats have been a life saver. Oats are naturally gluten free, but to ensure that these oats maintain their gluten free integrity, Bob’s Red Mill handles them with care in their dedicated gluten free facility and batch tests to ensure gluten free status. To keep these nut muffins vegan and to bring out the most banana flavor, I use three mashed bananas and ground flax seeds to aid in binding. These gluten free banana nut muffins follow an easy to prepare, one bowl, quick bread method! First, toast the walnuts in a preheating oven. 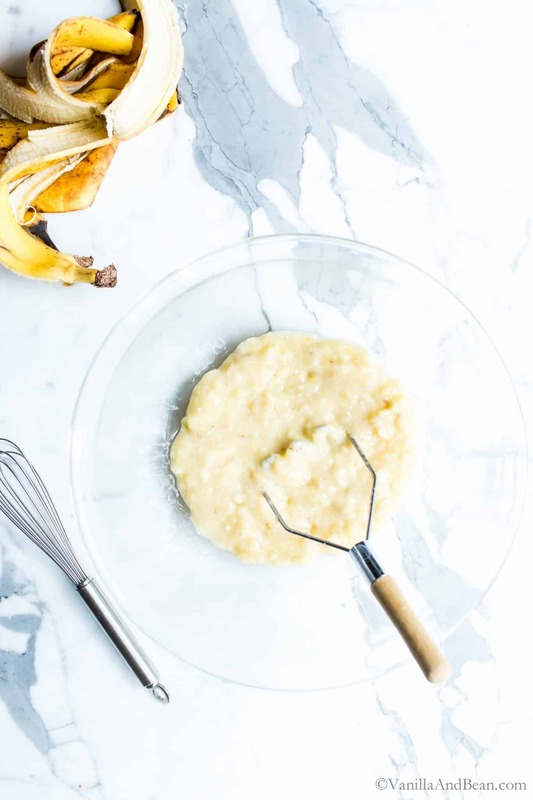 Meanwhile, mix the wet ingredients: mashed bananas, maple syrup, coconut oil, nut milk, vanilla extract and apple cider vinegar. Next, add the dry ingredients: oat flour, almond flour, tapioca flour, flax meal, salt, baking soda and powder. Whisk. Chop and fold in the walnuts. Last, line a muffin pan with tulip muffin cup liners. Scoop the batter and bake! See how simple they are to make? I recommend tulip style muffin cups to line a standard muffin pan for this recipe. Taller cups provide structure and enable the muffins to rise just a bit higher and produce more evenly baked muffins. I purchase or use this DIY tulip cup tutorial to make muffin cups. 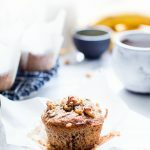 The combination of Bob’s Red Mill Gluten Free Oats made into oat flour, Almond Flour, Tapioca Flour and Whole Ground Flaxseed Meal make these muffins tender, fluffy, moist, texture rich and absolutely delicious. These are truly a healthy grab-n-go breakfast or snack muffin. This recipe calls for gluten free oat flour. I DIY my own using Bob’s Red Mill Gluten Free Oats. 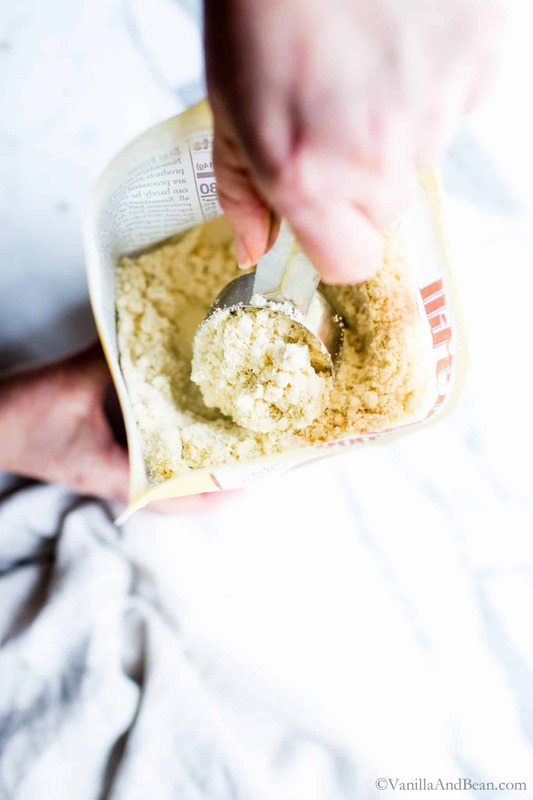 It’s super easy and economical – see my how to make oat flour post for more information. Freezer Friendly? Yes Please! Freeze any quantity of muffins on a sheet pan (a few hours). When frozen, transfer the muffins to a covered container for up to two weeks. Thaw at room temperature. 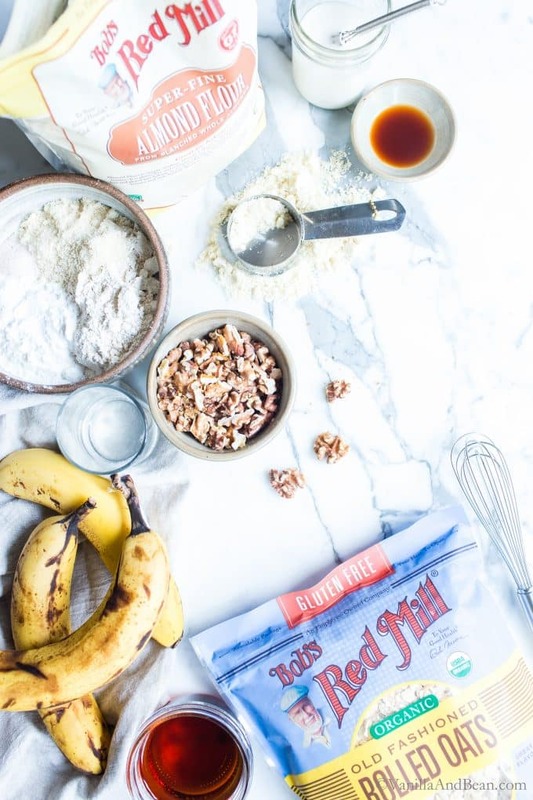 For more recipes using Bob’s Red Mill Gluten Free Oats and Almond Flour and so many other fabulous ingredients head to their website and be sure to check out Bob’s Red Mill on Facebook, Instagram and Twitter for more inspiration! 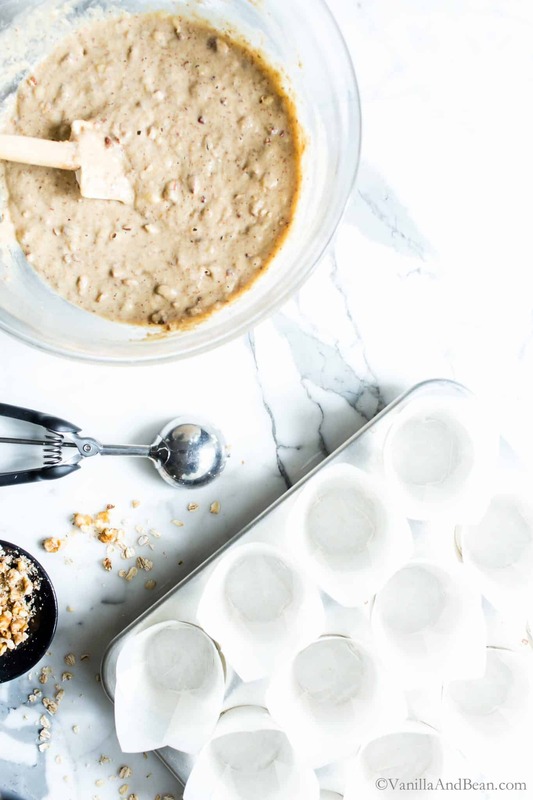 Naturally sweetened and one bowl easy, Breakfast Banana Nut Muffins are a healthy grab n' go breakfast or afternoon snack! vegan + gluten free *For more tips see blog post above! Preheat the Oven / Toast the Walnuts: Preheat the oven to 375F (190C). Toast the walnuts on a small sheet pan while the oven is preheating, about 15-17 minutes. Keep an eye on them starting at 14 minutes as they go from not toasty to over toasty fast! 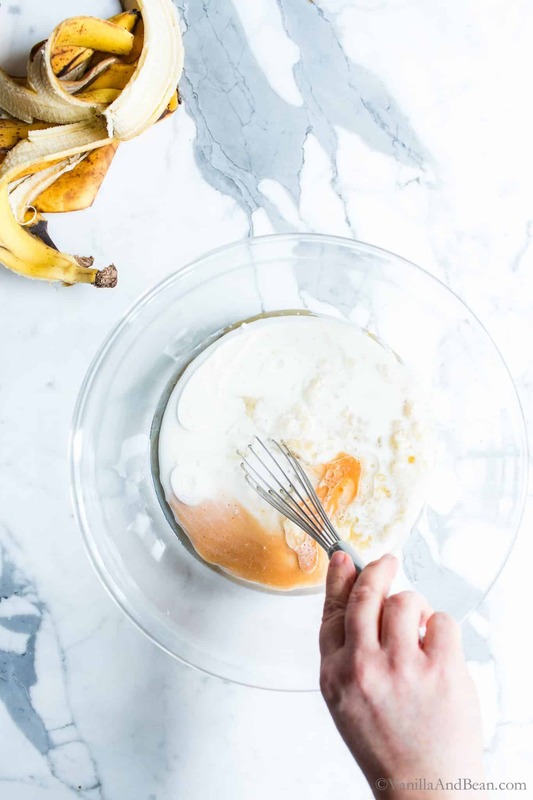 Mix the Wet Ingredients: While the oven is preheating and walnuts are toasting, in a large mixing bowl, mash the bananas, pour in the coconut oil, syrup, nut milk, apple cider vinegar and vanilla extract. Whisk until smooth. Add the Dry Ingredients: To the wet ingredients add the oat flour, almond flour, tapioca flour, flax meal, baking powder, baking soda and salt. Whisk all the ingredients until there are no flour bits left and the mixture is smooth. Set aside and rest the batter while the walnuts cool. Remove the walnuts from the oven. Transfer the walnuts out of the pan and onto a cutting board. Spread the walnuts out to cool slightly. Rough chop. Set about 2 Tbs aside to be sprinkled on top of the muffins prior to baking. Then, fold the walnuts into the batter just before scooping. Scoop / Pan the Muffin Batter: Line a standard muffin pan with 12 tulip style muffin cups (DIY your own). Scoop about 1/3 C (85g) of batter into each cup. An overfilled large cookie scoop works well too! Sprinkle a bit of chopped walnuts and a few grains of whole rolled oats on the top of each muffin if desired. Bake the Muffins: On the center rack in the oven, bake for about 25-27 minutes or until the muffins are golden, a toothpick inserted in the center of a muffin comes out clean and the muffins spring back under gentile pressure. Remove from the oven, and pan, transferring the muffins to a cooling rack. Allow to cool completely before unwrapping and enjoying. Store the Muffins: After completely cooled, store muffins covered at room temperature for up to three days, or freeze in a freezer container for up to two weeks. Thaw at room temperature. To rewarm the muffins, warm in a 350F oven for about 10 minutes. This recipe calls for gluten free oat flour. I DIY my own using Bob's Red Mill Gluten Free Oats. It's super easy and economical - see my how to make oat flour post for more information. I recommend tulip style muffin cups for this recipe. Taller cups provide structure and enable the muffins to rise just a bit higher and seem to produce more evenly baked muffins; my preference. I purchase or use this DIY tulip cup tutorial to make muffin cups. I enthusiastically recommend an oven thermometer! I’ve baked in commercial bakery and home ovens, old, lightly used and brand new ovens – they all have their own personalities with temperature variations and fluctuations. Knowing the temperature of your oven is important for the best outcome, and evenly baked goods; super important in baking. Most amazing gluten free banana nut muffin I’ve had! Hi Traci! Oh my gosh, thank you so much for your note and for giving the recipe a go! Hooray! My muffins were delicious, but gooey. They were in the oven for 25 minutes and tested dry. Hi Cassandra! Thank you for your note. I’m happy to hear the muffins were delicious! But I’ve not heard of the gooey problem from others on social that made these muffins. I’m stumped. Was your oven preheated? Do you use an oven thermometer? Did you use tulip wrappers? I wish I could be more help. There’s nothing better than banana nut muffins fresh out of the oven! I’m blown away by how good these look bc I know how hard it is to get vegan and gluten-free right. Looks like you’ve nailed it. Nice work, Traci! This may be a dumb question, but could I use Tapioca starch in stead of Tapioca flour? “tapioca flour/starch”. Bob’s Red Mill package reads “Tapioca Flour – same as Tapioca Starch.” I hope this helps and you enjoy the recipe! I just love how the muffin is sitting centered (seemingly) under a spotlight! It deserves all the praise and accolades! Nothing better than a classic and you have nailed it, once again!! Yum, I love banana muffins, Traci. These are the perfect grab and go breakfast or snack. Yes please to the walnuts and the fact that these are vegan is a plus for me – I rarely have eggs in the house. Looking forward to trying these! PS: I just read an interesting article on NPR about Bob’s Red Mill and how they were one of the earliest companies to start offering gluten free products. You always save me when I’m in need of a gluten-free recipe to make for a few friends of mine who are GF! And even though I don’t need to eat GF, I always end up enjoying it too. I know I’d love these baecause I love all Bob’s products, as you know, and I would never, ever pass up a yummy banana muffin! Ever! Congrats on your partnership Traci! Can’t wait to give these a try. Happy weekend! Hi Tracy, how about a good substitute for the taiioca flour? Arrowroot powder is what my search came up with. Or can I use more of the almond or oat flour instead? Hi Mary Ann! I wish I could say based on my experience, but I just don’t know. Like you, I did a little searching and found: 1 tablespoon of Arrowroot = 2 tablespoons of instant tapioca flour (I don’t know if Bob’s Red Mill is qualified as instant or not? The package does not say instant). Since tapioca flour makes these muffins light and fluffy, and this is a characteristic you’d like to retain, I wouldn’t omit it for more almond or oat flour. The muffins will be denser if you do so. I hope this helps, and you enjoy the recipe! Please let us know too, if you give them a go and share your tips!